Welcome to Board Watch for WCCUSD’s December 7th Meeting! At the December 7th Board of Education meeting, our school board swore in two new members: Tom Panas and Mister Phillips. The Board discussed how to spend the College Readiness Block Grant. They also approved a resolution that supports students and families who are undocumented, Muslim, or people of color against potential immigration enforcement at schools. Additionally, the Board recognized El Cerrito High’s Theatre Program and Hanna Ranch Elementary for receiving the Gold Ribbon award. Lastly, at this meeting, students, teachers and community members attended to advocate for more teachers at both Richmond High and Ford Elementary. At the beginning of the meeting, our newly elected board members Tom Panas and Mister Phillips were sworn in. Friends, family, and community members were in attendance to congratulate both Panas and Phillips. The Board took the time to appreciate former members Randall Enos and Todd Groves. In light of their departures, the Board was required to elect a new President and Clerk. Liz Block was elected as Board President, and Valerie Cuevas will take on the role of Board Clerk. Click here to learn more about Board Members Panas and Phillips. 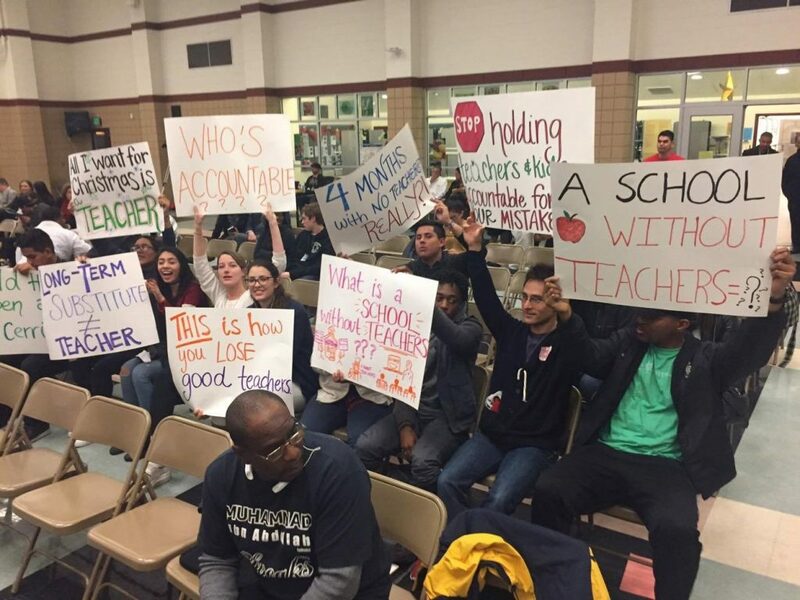 A crowd consisting of students, teachers and family members attended the December 7th meeting to demand our school board take action on hiring teachers for both Richmond High (RHS) and Ford Elementary. The group signed up for 15 separate public comments asking the Board for support. A number of parents demanded action from the Board. Ford Elementary parent Bernice teared up as she addressed the Board: “My daughter is losing motivation to go to school. She is 7, (and) she does not have a teacher. My Kindergarten son is the same. This is urgent. It is not just (about) getting a sub. Why don’t teachers want to come to our schools? How do we get teachers to want to stay and teach our children? It is not fair anymore for the kids.” An RHS teacher has filed a 90-page complaint letter that has compiled 316 signatures from other teachers, students, parents and staff members. To review the complaint letter, click here. The Board recognized that as a result of the November 8th national election, many of our students and families are afraid of possible targeting, abuse, and deportation. In response, the Board drafted Resolution No. 54-1617, which outlines specific steps that ensure students and families have the support of our school district and surrounding communities. The United Teachers of Richmond (UTR) teacher union also utilized public comment to share a resolution they had drafted. This was read for the Board’s consideration as well. After more spirited and tense debate among our school board members, the resolution was approved by 5/6 board votes. The majority of our Board agreed that passing the resolution as is would bring stability to the students and families of WCCUSD. They also agreed that amendments and tweaks can be made over time to better accommodate the needs of our community. Click here to view Resolution 54-1617. As a condition for receiving and spending state College Readiness Block Grant funds, school districts are required to develop and adopt a plan detailing how funds will be spent. District staff presented a 3-year budget plan to our school board, specifying activities, spending, and alignment with LCAP goals. Budget approval will be discussed at a later Board Meeting. 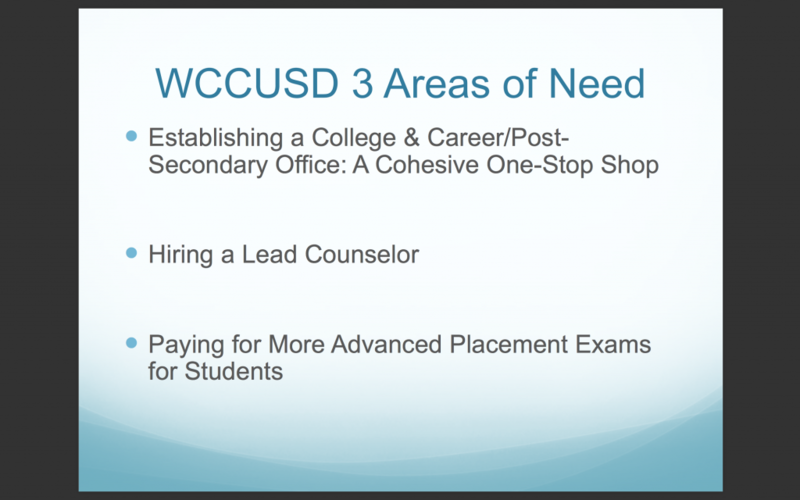 Click here to review WCCUSD’s College Readiness Block Grant 3-Year Budget Plan. The Board also recognized Hanna Ranch Elementary for receiving the Gold Ribbon School Award. 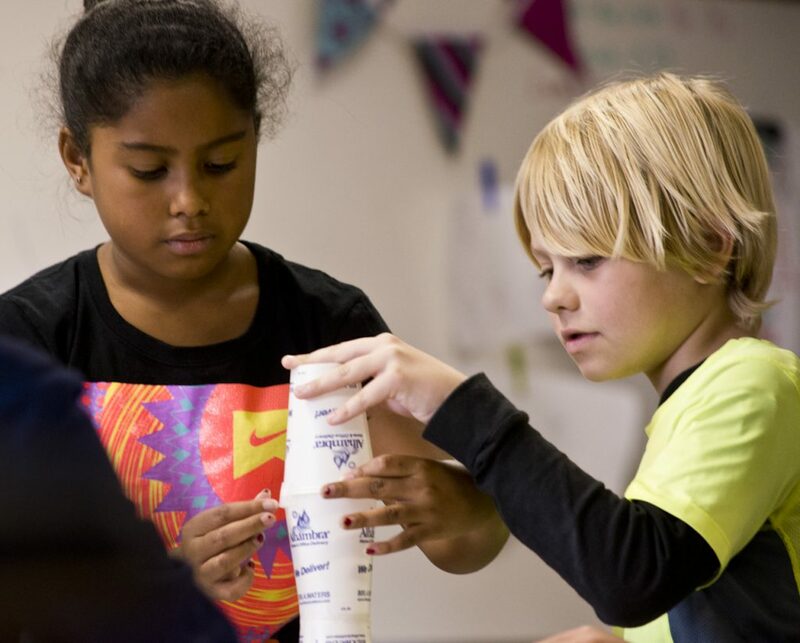 The Gold Ribbon Award recognizes schools that have made gains in supporting student achievement and implementing our state’s academic content and performance standards. Click here to review Hanna Ranch’s Early Intervention Program presentation.